Happy Chinese New Year, today is the New Year’s Day, Kung Hei Fat Choy. We don’t have to go visit any relatives, so good to sleep in. Woke up a bit late, and let’s do a nice brunch for the two of us, something nice looking to start the Year of the Monkey. 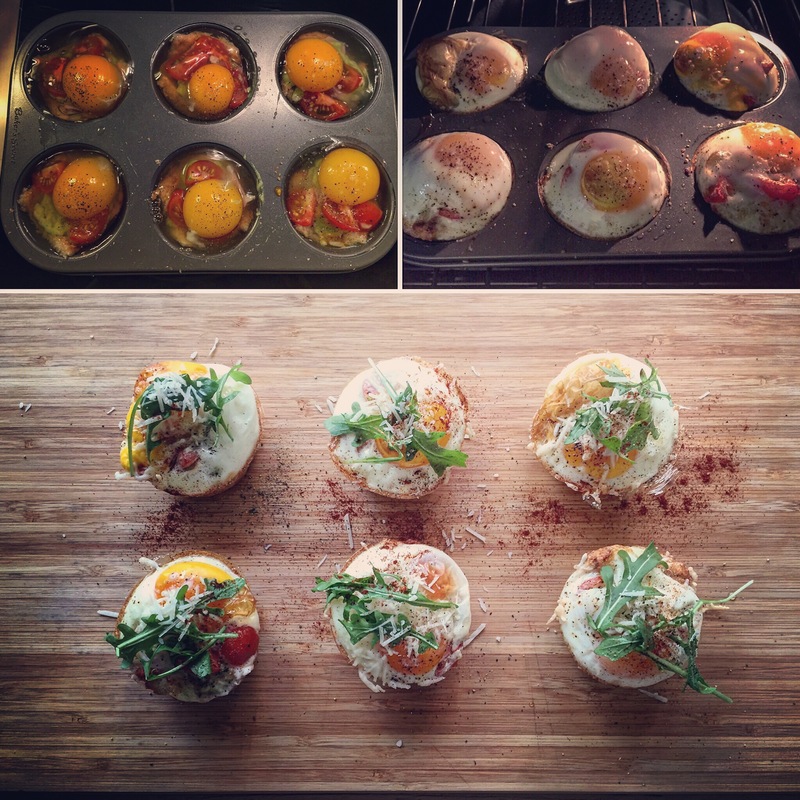 I always want to bake eggs with the muffin tray, because they will look so nice and cute. First of all, brush butter all around the tray inside, make sure nothing is going to get stuck there later on. Toast 2 pieces of bread, cut into 4 pieces and stuck each piece into the tray as a base, and brush some butter on each toast. Chop some ham into small pieces, place them on top of the toast, and put any kind of dip or sauce you like, for example mayonnaise, and I am using the avocado dip I’ve done last night. Then, cut the cherry tomatoes into four pieces, and place them into the tray. Finish it with an egg on top, nicely fill up the entire tray, and season each of them with salt and pepper. Place the tray in the pre-heat oven under 180C for around 15 minutes, add some parmesan cheese on top 5 minutes prior done. When they are done, remove them slowly from the tray, and serve them on the plate or board. Garnish them with some arugula or spring onion and parmesan cheese, season them with some black pepper as well.